Elkton Mayor Robert J. Alt, far right, meets with the owners of The Coffee Place as the town’s historic downtown business district commemorates Economic Development Week. Elkton, MD – Elkton is one of those charming old small towns that Maryland is so famous for. Founded by Swedish mariners in the 17th century; nestled at the northern headwaters of the Chesapeake Bay; Elkton once was the destination of choice, according to some sources, for ardent young couples looking to elope. The Town of Elkton, one of the state’s 28 designated Main Street Maryland communities, and the Elkton Chamber and Alliance have been working with DHCD through the Community Legacy program to revitalize its commercial district while preserving its unique history and charm. 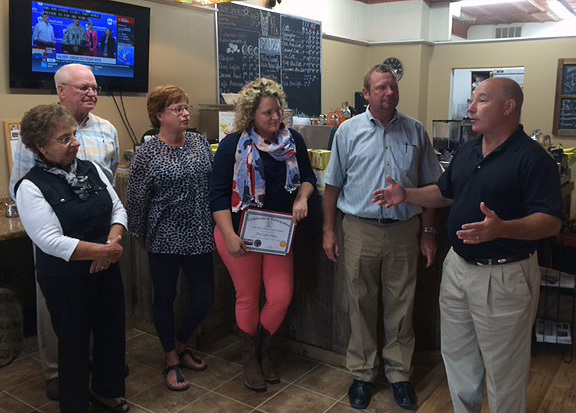 Thursday, in recognition of Economic Development Week, the Elkton Chamber and Alliance recognized The Coffee Place as the latest local business to participate in the alliance’s residential and commercial facade improvement program. Funded through DHCD’s Community Legacy program, the alliance has awarded $50,000 in less than three months to eight property and business owners in Elkton’s designated Main Street Maryland district. The projects range from $500 to nearly $20,000 and include painting, signage, awnings, window repair and exterior lighting. Since the program requires the property or business owner to contribute at least 50 percent toward the total project costs, these awards have leveraged $100,000 in improvements to buildings downtown. The project is part of the Hogan administration’s commitment to change Maryland for the better by helping the state’s small businesses innovate and grow. Through the Community Legacy program, DHCD provides grants that help local governments and community development organizations strengthen traditional downtown districts through projects that promote business retention, encourage homeownership and commercial revitalization.